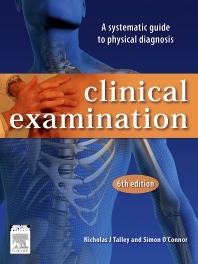 The sixth edition of Clinical Examination continues to serve all medical trainees with a clear explanation of history taking and clinical examination. Set out systematically, this best selling textbook has comprehensive coverage of the skills necessary for clinically evaluating patients. Thoroughly evidence based and referenced, in full colour with superior artwork and design, the book comes with free and complete access to Student Consult.